The TopView Contacts, Schedules, Global Settings desktop application allows easy access to the global notification settings for TopView. Note: this desktop application runs on the TopView machine. You can also edit global notification settings using the TopView Web Configurator. Notification groups: Email-SMS, Voice, etc. This application exists as a separate application from the TopView Configurator so that adjustments can be made to the notification settings without giving users access to other alarm configuration information. 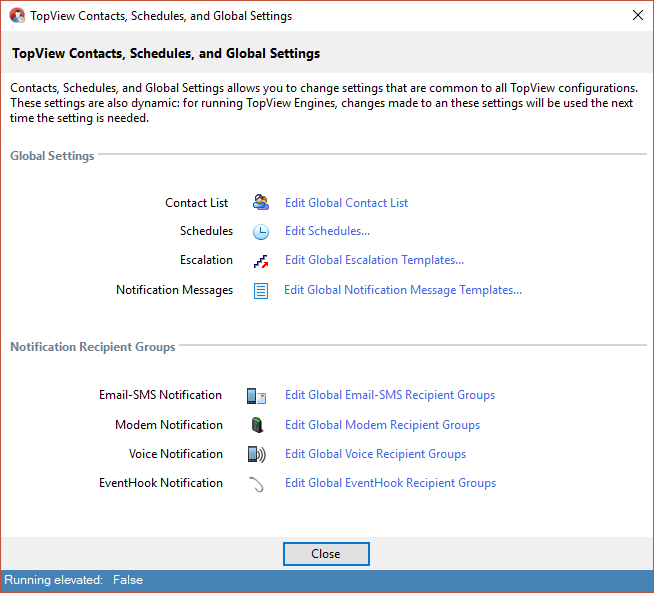 Changes to the global notification settings can be made without requiring a restart of running TopView Engines.